First of all let me say Thank You for the overwhelming support I have received after writing my most recent post. I know that we may have differing opinions on various topics, but I am grateful for your understanding and for the civility in comments that I have received both publicly and privately. Now to today’s topic. Most of my readers know that I am very passionate about the work that EACH does, that was why I was moved to write the last article…but sitting behind a keyboard and typing, retweeting, liking, sharing, and Instagramming is just not enough….not when there is £10 Million that needs to be raised and we are already 2 years into the process. I don’t want EACH to be waiting forever for the Nook…not when they need it NOW. I am not independently wealthy, If I was I’d have written the needed checks a LONG time ago. Last night I sat thinking about all the projects I have going and what i wanted to focus on from now through the end of the year. As I was thinking I just knew that above all I wanted to help EACH get as close to finishing the fundraising as I could. I wasn’t sure how I could do that and then it hit me….I could use a skill that my grandmother and mother taught me. I chose the butterfly because of the supporters badges/pins that EACH has. 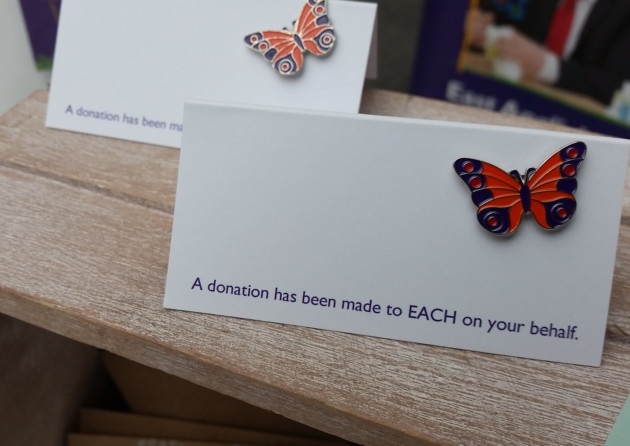 The badges are an orange and purple butterfly. 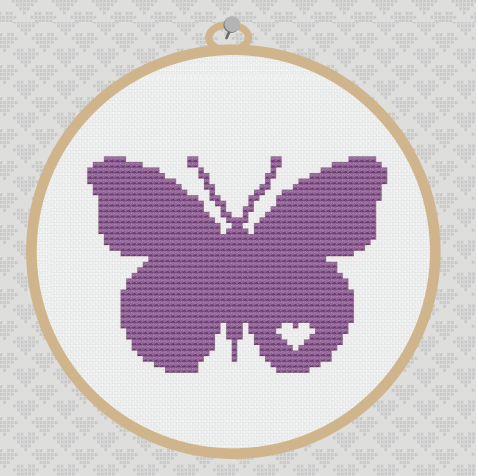 The cross-stitched butterflies will be hand stitched by me and the finished design will be sent to you ready for you to frame. The butterfly is 5 inches x 5 inches and so would best be framed in an 8 x 10 frame or a 5 inch hoop as shown in the photo above and below. The pricing for these is $30 + shipping . That covers all of the materials for stitching and the costs of getting help to ship them. 25% of the cost goes to EACH. I also have other patterns available at the site and I can do other pieces on request, if there is something else you would like to have done and you don’t see it, just ask and I’ll see what I can do. I’m ready to get stitching….help me help EACH?